There’s something comforting about the never changing–those restaurants you’ve been going to for years that you know and love, and have come to expect. You know the quality, you would bet your life savings by the she crab soup and nothing excites you more than sharing the experience with friends and family who’ve never tasted and seen. At the corner of Mallory and Beachview streets located in the Pier Village of St. Simons Island, Georgia sits one of my family’s constants: Barbara Jean’s. 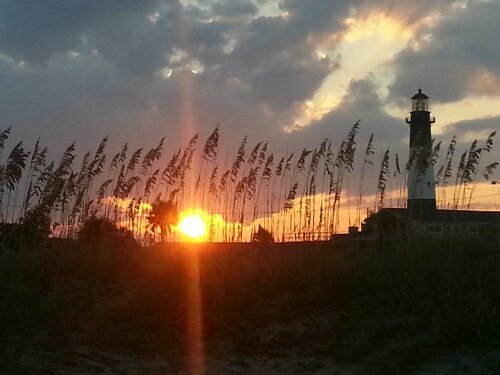 You may have visited in the Golden Isles, or in one of the four locations in South Carolina or Florida. Whether you go for the famous crab cakes or the pumpkin bread and the sweet jalapeno corn bread with cinnamon butter, Barbara Jean’s Easy Southern Dining makes deciding where to eat lunch or dinner a cinch! It’s rare to visit without a wait, but always worth it. I’m on the left and that’s my mom, Debbie, on the right. Ahh, the blessed bread basket. It is the thing I look forward to most at Barbara Jean’s. Caution: sample each variety and take the rest to go! The appetizer portion of coconut shrimp comes with four large shrimp and a mango dipping sauce. It is more than enough to fill me up! 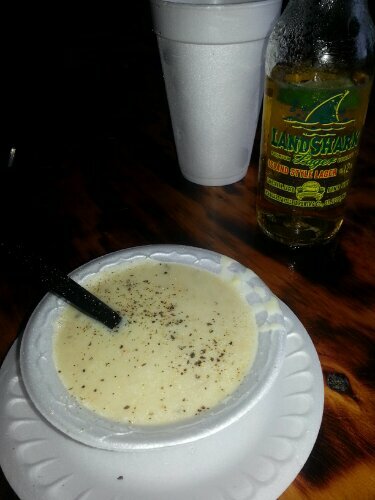 The she crab soup is cream based and filled with fresh, lump crab meat. I like to pepper mine heavily and sprinkle crushed saltines over the top. I took a friend who had never been to visit recently and upon getting his drink, he said, “Now that’s a tea glass!” I recommend ordering a half and half tea with a fat wedge of lemon. Barbara Jean’s is known for their famous crab cakes. This is the crab cake and grilled shrimp over rice dinner with stewed tomatoes and broccoli & cheese casserole. My favorite seat in the house is by the bay window overlooking the Pier Village shops. In the summertime, every table is usually full and the place is bustling with wait staff, bus boys and hungry tourists and locals. Traveling with Fido? Grab a seat on the patio. Dining alone? Pull up a chair at the full bar and order up your favorite cocktail. The menu prices range from $4.99 for a cup of soup to about $24 for the most expensive dinner entrée. The food is Some Kinda Good y’all, and my best friend swears by “The Chocolate Stuff.” Cobbler-like and better than a brownie, it’s Barbara Jean’s signature dessert and is served in a big bowl with homemade whipped cream. Other menu items include Tuna Steaks, Shrimp & Grits and Chicken Fried Steak. 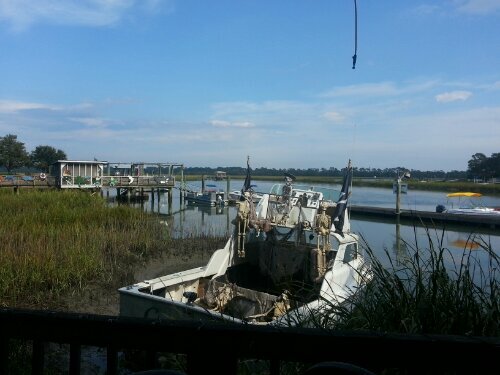 The restaurant is coastal and down home all at the same time…my kinda place! After dinner, walk along Mallory street or take a seat at the Pier to see what the fisherman are reeling in. Of all the places to eat in the Golden Isles, Barbara Jean’s should be at the top of your list. I’m convinced that all I really need in this world is a lifelong friend and a pile of crab legs on the Southern seacoast. There are times when my soul feels so content, like if in that moment life were to end, I could slip from the Earth with a smile on my face. That satisfaction, that fulfillment only comes from good conversation–the kind where you can bear your soul and not be judged, paired with the taste of food so fresh it was swimming in the Atlantic only moments before it landed on your plate. 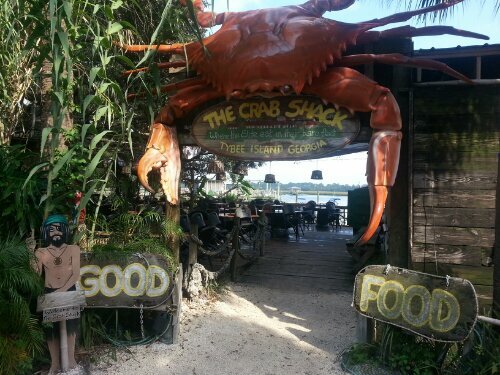 My blog, Some Kinda Good is all about good food and good company, and that’s what I experienced over the weekend at The Crab Shack on Tybee Island with Jennifer, my friend of 17 years. 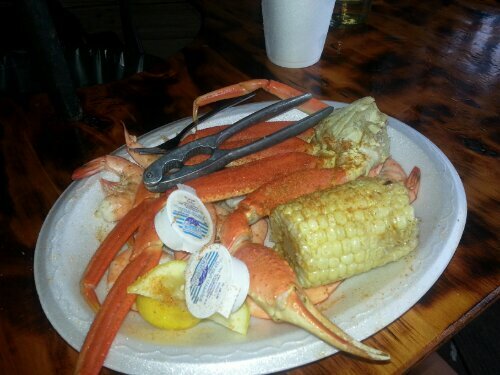 Located just off highway 80 as you make your way onto Tybee Island, The Crab Shack–Where the Elite Eat in Their Bare Feet–is THE destination for all things seafood. Known for their Lowcountry boil, the restaurant has been voted Best Seafood and Best Outdoor Dining since 1998. 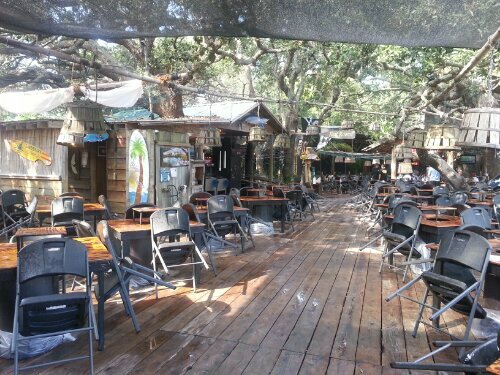 Offering indoor and outdoor dining, there’s really no bad seat in the house. When we first arrived, we sat on the deck overlooking Chimney Creek, and later moved inside to the screened in porch area when it started to rain. Since we visited in October, the boat was decorated for Halloween. From your table, you can hear boat motors cranking up and seagulls overhead. The menu features the Captain Crab’s Sampler where you can try an assortment of seasonal shellfish with corn, potatoes and sausage. 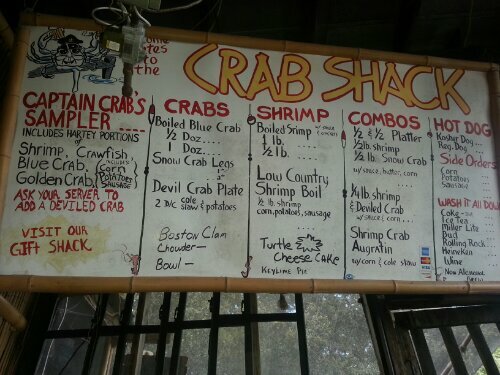 It also offers a variety of crabs–Snow, Alaskan King, Blue, Dungeness or Stone. Not only does The Crab Shack serve seafood, but true to its Southern region, they tout “The best barbecue on the beach or anywhere else.” The sides include corn, potatoes, sausage, smashed taters and slaw. 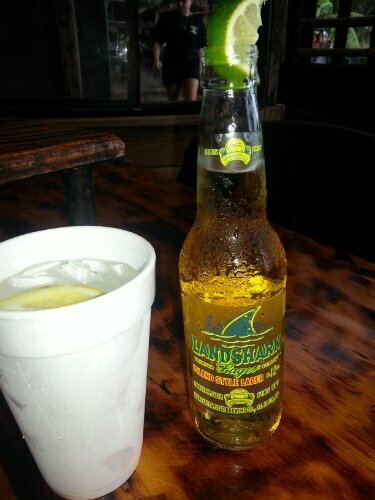 I ordered a Landshark Lager–only fitting being on the island–with a cup of Boston Clam Chowder and the Half and Half dinner: A half pound of snow crab legs with a half pound of wild Georgia shrimp for $19. 99. It came with corn on the cob. There are holes in the center of each table for discarding shrimp hulls and empty shells and I love being able to just toss your paper plate when you’re done. It’s casual dining on the coast, the way it should be. This is the large deck that overlooks the creek. Age old Spanish-moss covered oak trees hang over the area, creating an ambiance where it’s impossible to be unhappy. 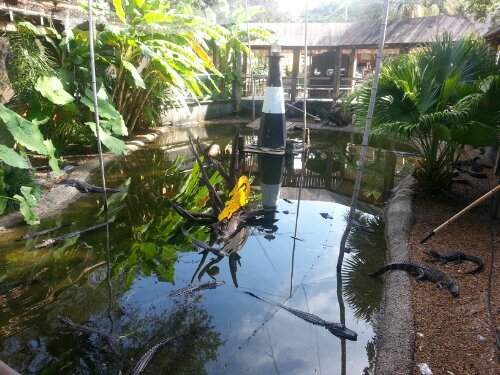 You can also feed live baby alligators on the premises. There are 78 to be exact! Pretty cool to see. 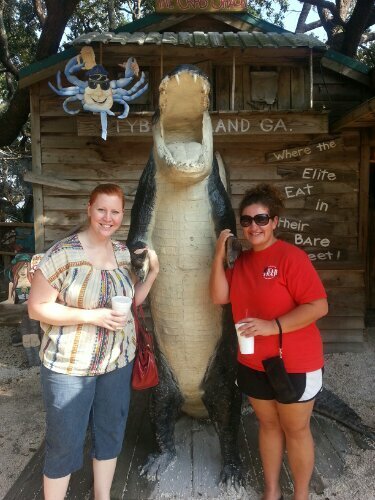 Once we acted like tourists and took our photo with the Croc (this made me feel like we were 12 again on a family vacation), we took our to-go cups of sweet tea and made our way out to the beach. Jennifer is the red-head on the left, and that’s me on the right. I counted 53 pelicans fishing over the ocean that evening, watched the sunset by the lighthouse and touched down in the Atlantic one more time. We rode 80 West back home with the windows down and Southern rock on the radio, the palm trees passing in the wind. 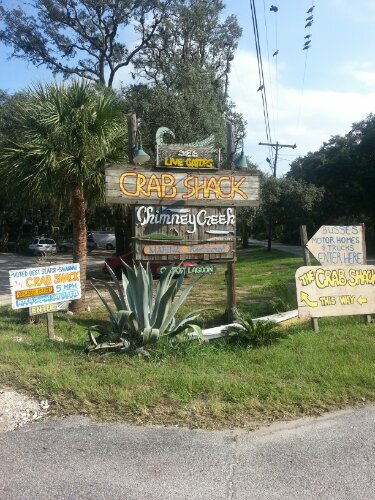 See more pictures below from our visit to The Crab Shack–and be sure to grab a good friend and make the trip. The only time you won’t find them open is on Thanksgiving Day, Christmas Eve and Christmas Day.